You can use several different travel services in Montenegro; plane, train, bus, ferry and of course taxi. Depending on your needs, you can coordinate your transportation to your budget, even if you decide to use a plane, like travel service in Montenegro. In Montenegro there are two airports, and as it is well known, travel service by plane to Montenegro is the most comfortable way of travelling. One is located in Podgorica, the capital of Montenegro, and it is about 13 kilometers away from the city center. The airport building was renovated a few years ago, and it meets all the requirements for safe and comfortable air transportation. It is the main port of Montenegro Airlines. If you have a plan to travel by plane to Podgorica or Tivat, you can check here all information about airports in Montenegro. From Podgorica, by plane, you can get to several European cities by direct flight; Vienna, Paris, Rome, London, Frankfurt, Belgrade, Zurich, Istanbul, Ljubljana and during the summer season to Moscow, Sant Petersburg, Kiev, Warsaw, Perm etc... Beginning in the summer of 2013th, Ryanair connect Podgorica and Brussels twice a week, and by the spring of 2014th, also twice weekly to London. With this company you can fly from London and Brussels to Podgorica, and return ticket starts from 39 euros, so that this way of travel service to Montenegro has become available for every budget. Second airport in Montenegro is in coast city Tivat. This airport is not very frequent in winter, but in summer season there are about forty landings per day. Tivat Airport is located just a few kilometers from Tivat, and Kotor is just 6 kilometers away. Tourists who come to Herceg Novi, Boka Bay, Tivat and Kotor prefer this airport because of the vicinity. All cities in Montenegro are mutually well connected with bus services, and bus is the most common travel service in Montenegro. But this is not situation with neighboring countries, except Serbia. Because of traditionally good relations, but also of a large number of tourists from Serbia, there is a many departures daily, from a lot of cities in Montenegro to Serbia, especially to Belgrade, Nis and Subotica. If you want to travell from Montenegro to Bosnia by bus, buses are going in direction of Sarajevo and Banja Luka. From Podgorica bus station to Albania there is no bus transportation, but during the summer season it is possible to find a ride from the coastal towns Ulcinj and Bar, in direction of Shkodra and Tirana. Bus transportation from Podgorica to Croatia, is also poorly organized. There is only one departure from Podgorica to Dubrovnik, usually at 6h in the morning, but during the season there are more departuresfrom Kotor bus station and Herceg Novi, but it is best to check the official websites, or contact them by phone. Bus transportation to Croatia is much easier to organize from Herceg Novi, because of the proximity of the border. Interconnection of Montenegrin cities by rail is not at a high level, so this category of travel service in Montenegro is not so popular, except for passengers which are traveling to Bar and Bijelo Polje. 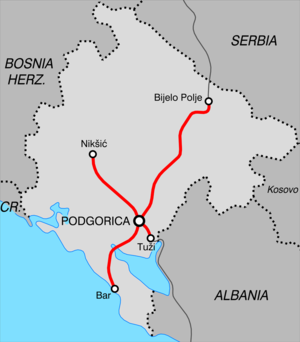 Trains from Podgorica runs to the south and north, and in direction of city Niksic. From Podgorica to the south, trains runs to the city of Bar, which is a big port for transport and cargo handling. Trains are going to the north, to the cities Kolasin, Mojkovac, Bijelo Polje and further in the direction of Serbia, to Belgrade. Due to the rather poor condition of the railway infrastructure, the trains always late, and they are not a reliable form of transportation. During the summer season it is a big crowd for all departures towards Serbia, and preferably with ticket purchase you should buy a reservation of seats. Given that the schedule changes twice a year, check your departure/arrival at the railway transportation in Montenegro official website, where when you fill out the booking form, you can see the price of the ticket. The company “Barska navigation” realizes its basic activity (maritime traffic) through the transportation of passengers and cargo by vessel „Sveti Stefan II“ on lines between Montenegro and Italy (Bar-Bari-Bar). Ships sails twice a week from Bar to Bari, and vice versa. With the same ship, after docking in Bari, passengers can continue their journey to Ancona, and that is the only one travel service in Montenegro by fery. Ticket prices starts with 45 euros in quadruple cabins, and up to 200 euros in the cabins apartments. Price for transport of passenger cars from Bar (Montenegro) to Bari (Italy) is around 80 euros. You have to count on the extra costs of 12 euros, for a service fee. However, we recommend that if you plan to use this mode of transport, visit the official website of the Bar Shipping. Taxi service in Montenegro is a service that uses a large number of the citizens of Montenegro, not only tourists and foreigners, because it is a reliable and cheap transportation service in Podgorica Montenegro. The prices of taxi services in Montenegro are affordable, here you can see complete taxi price list, but you have to be careful, because of a large number of illegal taxi operators on the streets, especialy if you are traveling from airport Podgorica. If someone offers to drive you for a destination of fifty kilometers, for the amount for which you can not travell 10 kilometers in your country, do not use these services, because fuel prices in Montenegro are at the level of the European Union.